I love this photograph. It’s a mistake, a simple and predictable result of my boundless tech un-savvy. It was supposed to be a picture of Carlos, a travelling companion and dharma friend, diving off the bow of a boat into the Ganges at dawn. He’d insisted on performing this inadvisable feat because a couple of us had submerged ourselves in the waters on the far shore a few nights before, and he didn’t want to be outdone. He wasn’t. 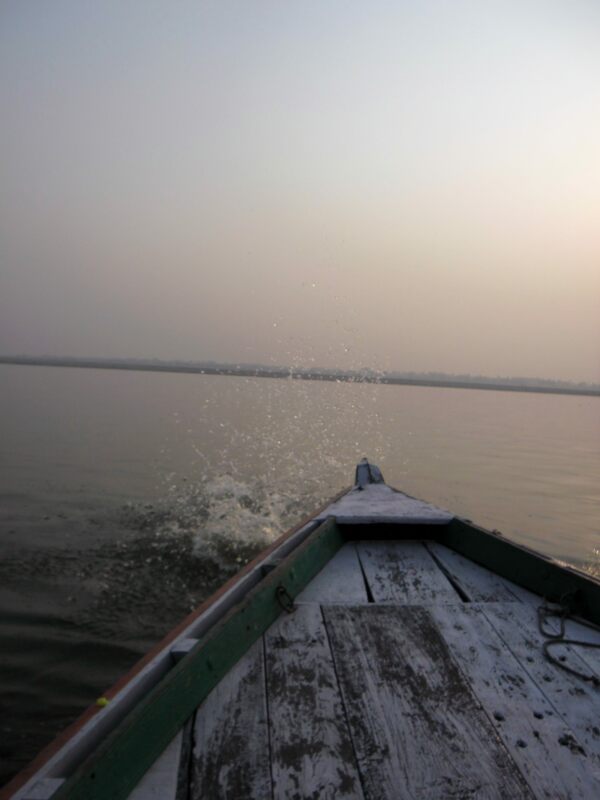 Where we’d timidly dipped ourselves into waist-deep water, he dove out of the boat in the middle of the river, swam to the far shore, then swam back through the increasingly filthy water to the ghats of Varanasi. He’d asked to be photographed for posterity. I snapped the picture just as he was suspended in the air between the boat and the surface of the water, oblivious to the fact that there’s a split second delay between the pressing of the button and the digital capturing of the image. What I was left with is a picture of the scene immediately after Carlos disappeared below the surface of the water, a not-too-useful memento of his unsurpassed act of bravery and devotion. The picture has remained disregarded in my photo gallery for four years owing, again, to my behind-the-curve tech skills; I don’t know how to delete pictures from the file, and I’m too lazy to figure it out. I ran across it recently as I perused my photo gallery in search of India pictures for an upcoming showing at the local library. It caught my eye immediately. I’d never realized that, although Carlos isn’t visible in the photo, the splash he created as he dove into the water is. Here, then, is one of those delicious cases where two wrongs make a right: a picture that shouldn’t have been snapped to begin with and should have been deleted years ago will be one of the coolest photographs on the wall, a strikingly simple, beautiful image of absence and emptiness worthy of a Pink Floyd album cover. This photograph is noteworthy not for what it shows, but for what it doesn’t show; there’s no one in it. Not Carlos. Not me. Not the boatman or either of our other two travelling companions. Not a single one of the four million people in Varanasi. It’s an interesting reminder of what’s going on just beneath the veneer of drama that we unconsciously lay over reality on a moment to moment basis; namely, not much. Universal energy manifests as various forms and shifts from action to reaction, but it’s all the same energy. All that happened in the moment that this photo was snapped was that God jumped off of God into God while God took a picture. In other words, nothing happened.